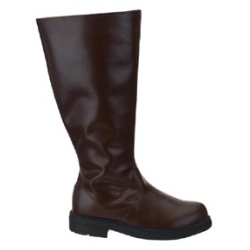 Brown captain pirate boots. Available in men's sizes Small (8-9), Medium (10-11) and Large (12-13). Please note that these shoes and boots are manufactured with a masquerade quality and not intended for everyday wear or street use. Their price offers an affordable, great looking theatrical shoe or boot not previously available. However, once again please note they are sold at a price point in line with their quality and durability. The Costumer sells dozens and dozens of shoes and boots from this line of footwear with the understanding that they are for limited usage not for long term use. They are nonreturnable after being worn. These are intended for short run theatrical performance purposes and or masquerade.